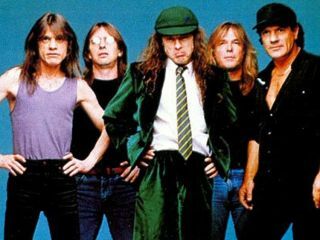 AC/DC have posted a 30-second preview of Rock 'N Roll Train on their official MySpace page. It's from the first single of their long-awaited album, Black Ice, While the excerpt is basically the opening riff, it's a good indication of what fans can expect from the band's first album in eight years - a 15-track bonanza that recalls the down-and-dirty, blues-based rock 'n' roll of its iconic 1980 album Back In Black. Due Oct. 20 exclusively in the US at Wal-Mart and Sam's Club stores as well as ACDC.com, the album opens with Rock 'N Roll Train (which hits radio on August 28). But that's just one of many gems to be found. According to Billboard, Big Jack nods to the vintage major-key rocker Who Made Who, while Wheels is a hands-in-the-air nod to old favorites such as Highway To Hell and Givin' The Dog A Bone. Frontman Brian Johnson is in fabulous screeching form on tracks like War Machine ("Better watch your back and cover your tracks!," he barks), the sparse Decibel, partially sung in his deep, natural voice, and the anthemic Anything Goes. The album ends with the title cut, an old-school blues rocker in which Johnson growls, "I'll gouge your eyes out." From a band that once threatened to Walk All Over You, that sounds about right.